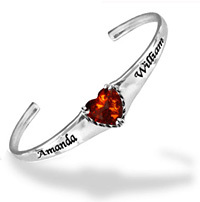 Traditionally, a mother�s ring is a simple band set with the birthstones of her children. 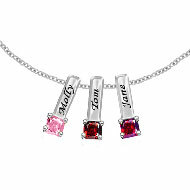 The modern twist to this sweet custom is family jewelry�perfect to showcase the deep connection among family members, not limited to moms alone! Family jewelry, rings and pendants are a stylish update. 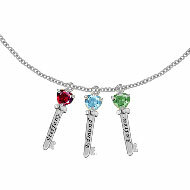 Any woman would be happy to affirm her close relationship to her mom and sisters by wearing matching family pendants bearing all their birthstones. Perhaps you�ll have a thumb ring set with the birthstones of adored nieces and nephews for their bohemian aunt, or a set of matching family rings showing off the birthstones of parents, their adult children and their spouses as a special holiday gift, with the mother-in-law and daughters/daughters-in-law sporting matching family rings or pendants. The possibilities and combinations are truly limitless. Read more. As we are exhorted in Exodus to honor our fathers and mothers all the days of our lives, so shall we declare that unswerving devotion to all we meet. Family is truly the most important thing in our lives. The love of our mothers sustains us and by creating for her a personalized gift of family jewelry, rings and pendants you let her wear her heart on her sleeve stylishly. Not for her, the tacky t-shirts declaring her a Granny of Four, but an elegant ring studded with the colorful gemstones symbolizing her grandchildren�s birthdays. Give her a lovely gift, be it ring or pendant, to show all who meet her how you love and honor her, how you took time to design for her such a beautiful mark of family love. Family jewelry, rings and pendants come in an array of styles from simple to ornate in silver or gold. Certainly you can find a style that suits your taste, or your sister�s or your mom�s sartorial flair. 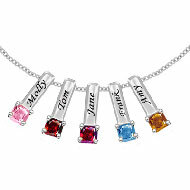 Be creative and include aunts, cousins, any relative to whom you are especially close, in the making of family jewelry. That childless aunt who loves your kids as though they were her own grandchildren will love a grandmother�s ring or pendant to honor her devotion. The great grandmother who has seen her descendants in great numbers would beam with pride at a pendant bearing the birthstones of those cherished grandbabies. Choose and design your family jewelry with love, aiming for it to be an heirloom, an outward sign of the strong bonds of affection that bind us so closely.